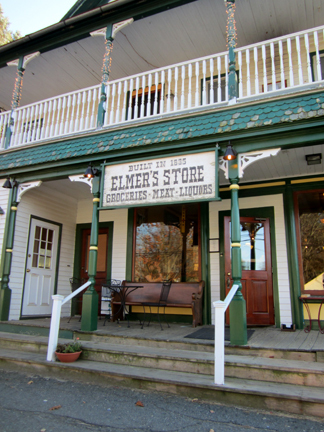 Elmer’s Store on Main Street in Ashfield, Massachusetts, is a bright, friendly place. Owner Nan Parati and her staff smile as they sell food and gifts. The walls are painted vibrant colors mixed by Nan herself; she is an artist and set designer as well as a storekeeper. And on Friday afternoons and evenings irresistible smells emanate from the small, well lit kitchen. On a recent Friday afternoon when I stopped in, kitchen manager Jane Goodale, assistant chef Michael Hulbert, and chef Son Tremé were chopping, washing, and peeling local vegetables and meat for Elmer’s weekly Friday dinner. They joked and chatted as they worked, clearly at ease in the kitchen and with each other. I asked Nan about Son’s name. “’Son’ was his nickname growing up,” she informed me, “but he made it his legal name.” He apparently added “Tremé” to his legal name as well. Who am I to cavil at a name? I assure you that “Tinky” doesn’t appear on my birth certificate. Son’s name suits him. Son began working in the restaurant business in New Orleans, he said, although he didn’t plan at first to cook as a career. He enjoyed the rich food of his native city, but it wasn’t until he moved north and started cooking more healthily that he knew for sure he was going to be a chef. He worked at a number of restaurants in Massachusetts, ending up as a breakfast chef at Elmer’s before taking time off to work on a culinary degree from Johnson & Wales University. He has finished his coursework and is scheduled to graduate in 2013. “As you can imagine, I am extremely proud of him!” beamed Nan Parati. 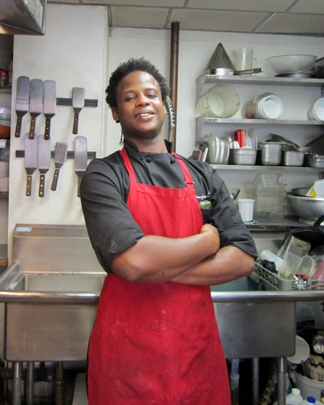 Son Tremé explained that he combines all of his food background in his work at Elmer’s. “My home training is all pot stuff. I do it the way I want to,” he said. He added that his schooling taught him to be more precise in his cooking. His practical experience has made him even more responsible. His home circle is also important to him. He is planning to create special food soon for the little baby girl to whom his partner gave birth in early October. “She’s my inspiration these days,” he said of little Belle-Soleil Tremé. 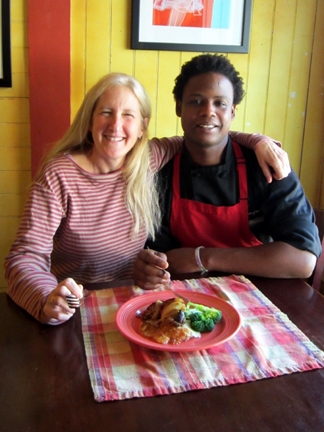 Nan and Son hope to expand the culinary offerings at Elmer’s, which currently serves breakfast and lunch every day (with special brunches on the weekend) and dinner on Friday evenings only. 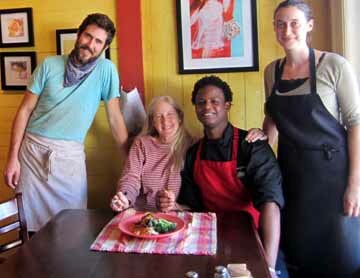 Soon another Louisiana chef, Charles Neville, will cook on the first Saturday evening of each month. I’d cook, talk, and eat with Son any day of the week. (He is the only chef who has ever kissed my hand at the end of an interview.) I was particularly taken with the seasonal, slightly sweet pork dish he served that evening at Elmer’s. 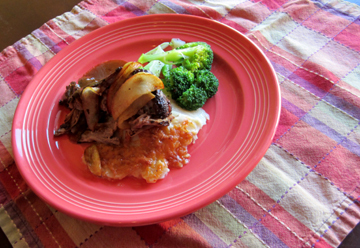 Son served his pork with potatoes au gratin, fresh broccoli, and sautéed apple slices. Gather all your ingredients and equipment. In a blender mix the shallots, garlic, vinegar, parsley, salt, and pepper. Add the cider to this combination. Place the pork in a pan, and marinate it in the liquids (refrigerated) for 24 hours. The next day, preheat the oven to 300 degrees. Remove the pork from the marinade, saving the marinade. Heat the oil in a Dutch oven, and sear the pork to brown it. In a saucepan bring the marinade to a boil. Pour it over the pork, cover the Dutch oven, and place it in the oven. Bake the pork until it is fork tender, 2-1/2 to 3 hours. Transfer the pork, moistened with a little of the liquid and tightly covered, to a cooler oven (250 degrees) or to the oven you have just been using turned off. Strain the cooking liquid. Discard the solids that come out in the straining (the garlic, etc.). Slice the pork, and serve it with some of the sauce and thinly sliced, sautéed apples. This entry was posted on Friday, November 30th, 2012 at 10:35 am	and is filed under Apples and Cider, Meat and Poultry. You can follow any responses to this entry through the RSS 2.0 feed. You can leave a response, or trackback from your own site. Yum, wish we could come experience Son’s creative creations. Very good article! And deliciously warming to read as the FIRST SNOW is falling outside! Jane, I hope you experience it long distance by making it. And Alice, I do hope the snow doesn’t last … yet! Thanks to you both. Since I didn’t have a pork shoulder, reduced the amts of ingredients and used 4 3/4 in thick pork chops instead. I had a friend coming for dinner on Sunday, and she is particularly fond of scalloped potatoes, so that with the chops and broccoli made a very nice meal indeed. We had the cranberry apple crisp for dessert (with orange zest this time) and she loved it. Took the recipe for both home with her. Great idea. I love cranberry with orange. And the chops were inspired; it’s always handy to be able to reduce these big recipes! I love pork with apples. I make a braised pork tenderloin (since there are only 2 of us) with apples and apple juice, seasoned with sage. I also braise the tenderloin with cranberries, instead of apples. Either way, it makes a tasty cold weather meal. I’ve been reading some of your other blogs. When do you sleep? Have a wonderful holiday with lots of good food and good cheer and a healthy and happy 2013. The cranberry sounds wonderful, Adelaide. And I promise you I sleep; after all, I post sporadically everywhere. But thanks for making me feel like Wonder Woman!